We provide first consultation free of charge. We would greatly appreciate it if you could come with your child for free counseling. The first intake session comprises disseminating Applied Behavior Analysis (ABA) by a Board Certified Behavior Analyst (BCBA) and providing more information about getting help for your child. Children・Center involves a group of experts who provide guidance based on the ABA theory. We provide ABA therapy for children with autism and other developmental disabilities. Under the guidance of a BCBA, clinical psychologists and professionals who have experience teaching abroad will teach your child. Children・Center is committed to the following services. 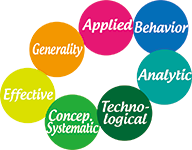 Children・Center are members of Association for Behavior Analysis International. We have conducted panel discussions and work with experts worldwide. Kozue Matsuda is the owner of Children・Center, Tokyo, Japan. She earned her Bachelor of Education in Elementary/Special Needs Education from the University of Sydney, Australia, and Master of Science in Psychology (Counseling and Advanced Applied Behavior Analysis) in the U.S. After graduating from the University of Sydney, she worked as an elementary school teacher in Australia, Japan, and the U.K. In 2008, she established an ABA agency in Tokyo, Japan. Children・Centers are located in Hiroo, Tokyo. We have two offices in Hiroo and further plan to open an office in the U.S. which would enable us to serve the international community. © Children Center inc. All rights reserved.